In 1968, a proxy working on behalf of the University of Texas Libraries walked into book dealer Ben Weinreb’s London shop and purchased his entire stock. There was no catalog and many copies existed in duplicate or bulk. 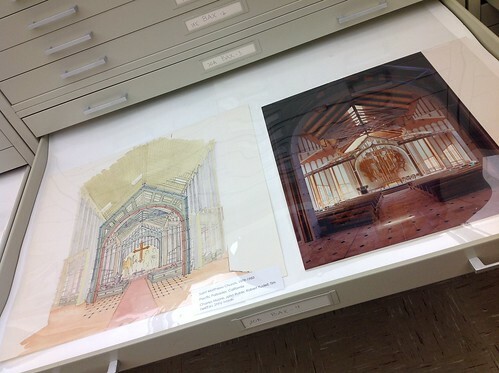 In 1970, a visitor to the university noted that these materials were still in boxes, but eventually over 50,000 books, journals, drawings and papers were assumed into the architectural book collection at the Harry Ransom Humanities Research Center where many volumes remain available to scholars and independent researchers. 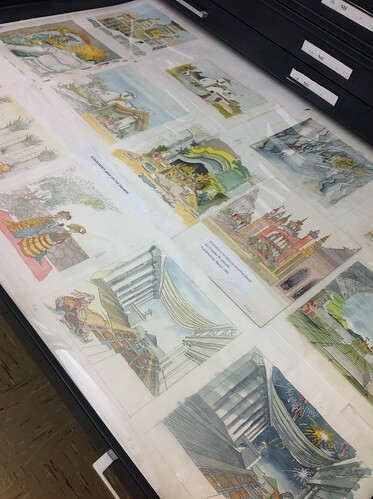 In the late 1980s, HRC, University of Texas Libraries and Architecture and Planning Library staff began discussing the possible transfer of Weinreb duplicates from the HRC to the Architecture and Planning Library’s special collections. This would lead to the infusion of over 5,900 of what Weinreb felt “were ordinary working books of value for the information they contained rather than their antiquity, rarity, or fine printing into the Architecture and Planning Library’s collection, increasing holdings by 15%. 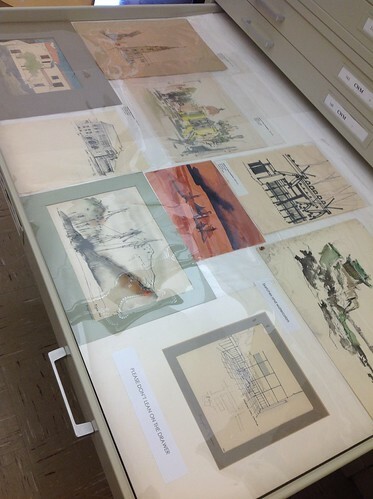 Unusual among the architect and educator libraries stored in the Architecture and Planning Library special collections, the Weinreb Architectural Collection expresses no discrete professional or academic vision. Rather, Weinreb, who has been described as an “incorrigible buyer of bulk,” was an accidental architectural enthusiast whose “restless ambition to fortify [himself] with [a warehouse] full of stock” eventuated the assembly of both rare and ubiquitous volumes on architecture in English, Dutch, French, German and Italian. These materials address a range of topics including hospital and asylum architecture, the history of interior design, ornament, plumbing, metalwork and design theory. In addition, several monographs for great residential palaces complement other such folios held in special collections. 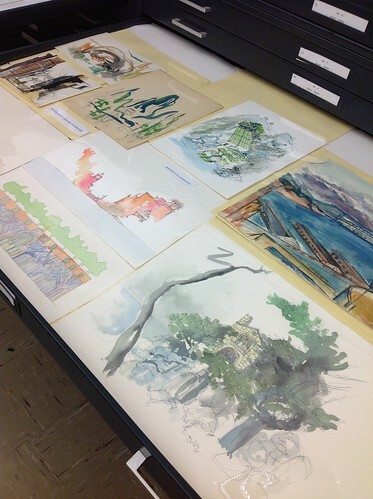 Stay tuned for more from the Weinreb Architectural Collection! Metzger, Max Josef. Konstruktions-Arbeiten des Kunst-und Bauschlossers. Düsseldorf: F. Wolfrum 190-. Konstruktions-Arbeiten des Kunst-und Bauschlossers is a portfolio documenting original designs for iron staircases, gazebos, pavilions, bridges, windows, porticos and more. The portfolio’s 100 plates provide detailed plans for these elements, including scaled renderings and exact weight calculations to assure design integrity after construction. The graphic assembly of each plate ensures maximum legibility while presenting plans and sections as not simply part of the design process, but, rather, as discrete works of art. Burdett, Henry C. Hospitals and Asylums of the World: their Origin, History, Construction, Administration, Management, and Legislation. London: J. & A. Churchill, 1891-1893. Hospitals and Asylums of World documents 19th-century plans for various convalescent institutions throughout the United Kingdom, British colonies including India and Australia, Europe and the United States. Over 100 plans document designs for various hospital typologies, including pavilion, block and corridor hospitals as well as the creatively titled “heap-of-buildings” type. Additional sections organize hospital plans by function such as treatment of infectious disease, cancer, etc. or convalescence through sea-bathing, mineral water or homeopathy, and by patron type such as children’s, women’s, and military hospitals as well as those designated for treatment of the poor. Medical schools, nursing homes and out-patient facilities are also documented. Though perhaps an unlikely commemorative platform, Hospitals and Asylums of the World, which was published in 1893, assembled plans for all the hospitals of London in anticipation of Queen Victoria’s Diamond Jubilee. de l’Orme, Philibert. Le premier tome de l’architecture de Philibert de l’Orme. Paris: Fédéric Morel, 1568. The first of two planned volumes on architecture, Philibert de l’Orme’s Le premier tome de l’architecture celebrates the presence of a tradition in building and design that is specifically French. While de l’Orme acknowledges the influence of antiquity in contemporary French architecture, he deconstructs its contributions—specifically its long canonized orders—in an effort to demonstrate the French innovation of a design expression distinct from Italian idioms. To that end, the book examines the basic geometry, spaces and architectural elements that might combine in a building, establishing a somewhat prescriptive design and construction methodology. In addition, de l’Orme outlines basic approaches to certain professional considerations (e.g. how to determine building cost, the type of character employees should possess, where to discover the best materials, etc.) uniting profession, process and product in the domain of architecture. Palladio, Andrea. I quattro libri dell’architettura. Venice: D. de’Franceschi, 1570. Published in four volumes beginning in 1570, I quattro libri dell’architettura is a treatise on architecture that outlines a systematic approach to building design and construction. This watershed tome, penned by Italian architect Andrea Palladio (1508-1580), is exemplary of the Renaissance preoccupation with antiquity, drawing heavily from extant Roman architecture and Vitruvius’ De Architectura to establish nine sets of rules that would guide design and construction. In the four books, Palladio addresses rules for construction and/or design according to type of architectural object and the role of that object in the system that would comprise the building whole. These objects serve to organize the text, with walls, ceilings, stairs, columns, doors, windows, frames, roofs and details receiving direct treatment as the architect prescribes appropriate material, function and style for each. Vitruvius. Les dix livres d’architecture de Vitruve. Paris: J. B. Coignard, 1684. In 1684, French anatomist and architect Claude Perrault published a corrected edition of his 1673 translation of Vitruvius’ De Architecture, a fragmented copy of which resides in the library of Paul Philippe Cret. This second edition deviates only slightly from the original publication, functioning to amend minor errors and provide augmented documentation of the ideals established by Vitruvius in his ten books. More importantly, this volume reaffirms a preoccupation with codifying an historicizing mode of architectural expression. Yet, while Perrault, whose design for the Louvre represents a rigorous transcription of 16th century classicism, exhibits a clear reverence for his Roman forebear, he also attempts to locate the trajectory of French architecture within the classical tradition. To that end, Perrault assumes Vitruvius into a specifically French discourse on architecture, constructing an explicitly French text that largely eschews the use of Latin or Italicizing verbiage and improves upon the copyists’ attempts to assign exemplary renderings to passages within the text. In this manner, Perrault establishes French classicism as a mode of architectural representation that is at once historicizing and nationalist. Stuart, James The Antiquities of Athens. London: J. Haberkorn, 1762. James Stuart’s four-volume The Antiquities of Athens is a practical treatise documenting ancient architecture in Athens. Produced in the tradition of Palladio and Desgodetz, The Antiquities of Athens looks to ancient architecture as a model for contemporary design and construction. Yet, unlike these earlier enthusiasts, whose work privileged Roman architecture, Stuart maintains that Greece was the cradle of the European architectural tradition where idealizing Hellenes refined the system of orders in a number of monumental structures including the Parthenon, Erechtheion and Propylaea. To that end, he examines a number of ancient Athenian buildings, producing meticulous documentation of the spatial relationship between architectural elements. Utilizing both text and wood cuts, Stuart also establishes the setting of each documented building, emphasizing the significance of building context to demonstrate that architecture doesn’t merely follow a measured and material prescription for its own sake, but rather to create an inhabitable space marked by craftsmanship, place and culture. Last week, the Alexander Architectural Archive celebrated the first few days of the Fall 2012 semester with an open house featuring drawings and other realia from the Charles W. Moore Archives. 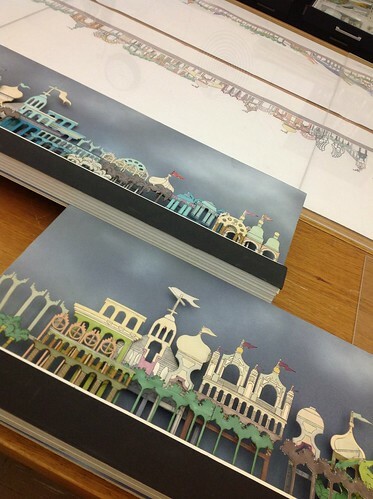 Moore’s professional archives reflect the architect’s esoteric approach to design represented in the many playful adaptations of familiar architectural tropes featured at the open house. For more on Moore and his archives, contact the AAA. Durand, Jean-Nicolas-Louis. Précis des leçons d’architecture données à l’Ecole royale polytechnique. Liège, Belgium: D. Avanzo, 1840-1841. In Précis des leçons d’architecture données à l’Ecole royale polytechnique, Jean Durand outlines the comprehensive methodology he established to train young architects studying at the Ecole. To guide the effective analysis of architecture and development of building projects, Durand explains the basic components comprising a structure (e.g., material, architectural elements, etc. ), their relationship to one another (e.g., proportion, etc. ), the basic means of assembly (i.e., construction practices through masonry, carpentry, etc. ), and the methods of communicating design through plans. Durand also discusses typology, examining buildings in context to establish certain principles for designing and constructing public buildings and those private buildings appearing in various settings. In this section, Durand begins to imagine buildings as systems of modules, an approach that prefigures later modernist attempts to modularize the design process. As a result, the Précis establishes itself within the great lineage of architectural primers while incorporating the industrializing tendencies of its time to usher a practice deeply rooted in tradition into a mechanized era. When I reviewed this book in order to write this entry I came across a note deposited by a former reader, whose preoccupation with the use of certain materials is marked by an interest in currying new business and collecting design fees. From time to time, such ephemera appears, and though it typically offers little or no insight into the specific intersections that produced it, its very presence provokes the imagination. Ruskin, John. The Seven Lamps of Architecture. New York: J. Wiley, 1880. John Ruskin’s The Seven Lamps of Architecture is a theoretical treatise that examines the art of architecture from a distinctly nationalist perspective rooted not only in patria, but in God and a celebration of the ingenuity and spirit of man. The specific abstractions employed to both organize the book and discuss the function and creation of buildings betray romantic proclivities as Ruskin associates commonly-held British social principles—sacrifice, truth, power, beauty, life, memory and obedience—with design and construction. Ruskin locates these values in architecture as practice (intellectual activity), craft (process of production) and historical agent (by which buildings become essential recipients and purveyors or signifiers of tradition) to construct a moralizing polemic that endeavors to reinsert spirit and vitality into building and buildings.